My alarm starts sounding off at 6:15 am on Thursday, January 17. “Dear Jesus,” I pray, “Please give me eyes to see, ears to hear, and an understanding mind. Oh! And keep me safe today.” This mantra in some form has been part of my daily prayers since I arrived in Cambodia in October 2017, but today it carries an extra amount of weight with it. 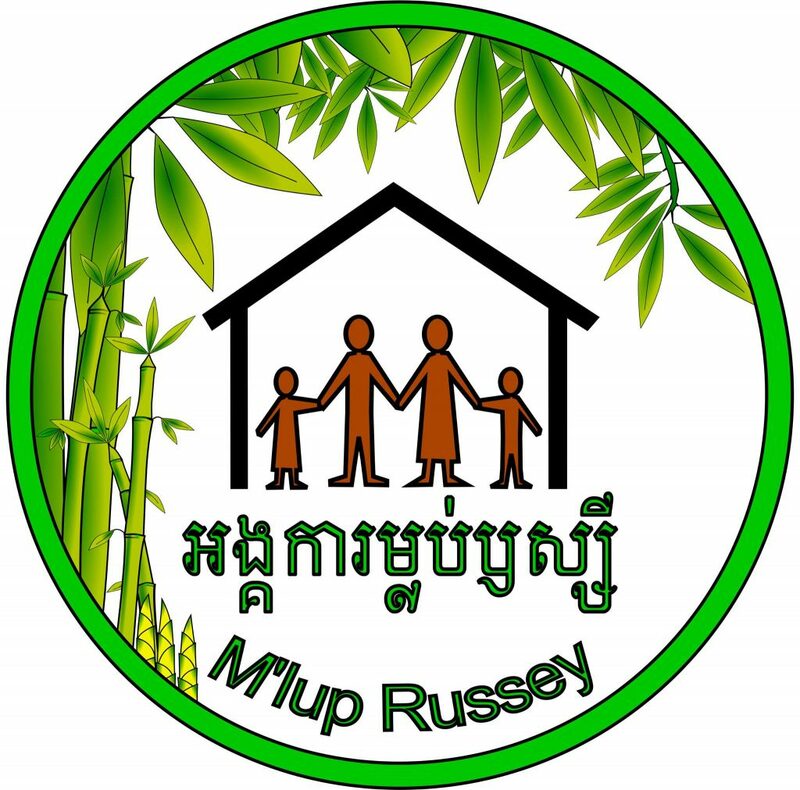 I have been working with M’lup Russey Organisation (MRO), a Christian, non-governmental local organization focused on care of orphans and vulnerable children, as their PR Advisor for two months now. 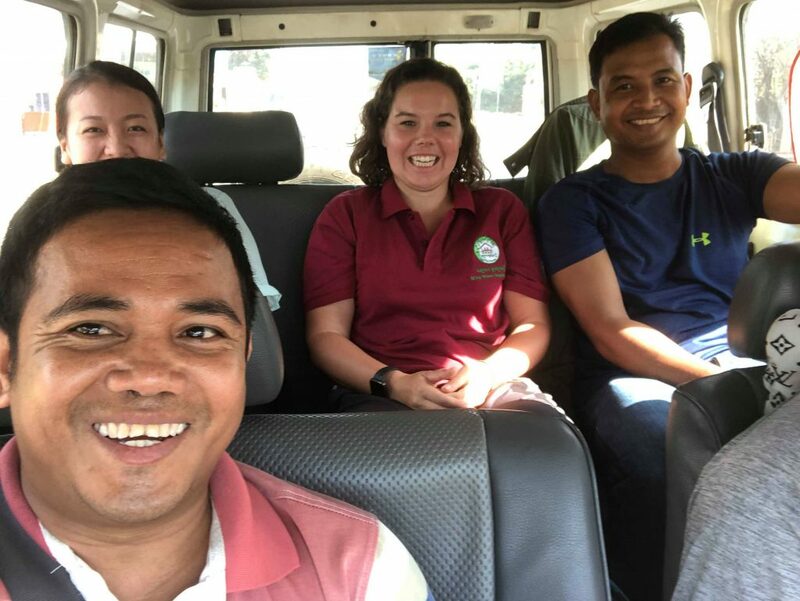 Today, I’m joining the MRO Social Work team to go to a province about an hour outside Phnom Penh, the capital of Cambodia, to witness how the MRO Social Work Team engages with children in Foster Care. I pull on my brand new MRO embroidered polo shirt and moto to the MRO Office to meet up with the team. M’lup Russey Organisation’s (MRO) logo. One of MRO’s objectives is to provide children in crisis situations with a safe place to stay where they can be loved and receive high quality care by emergency foster parents who are supported by well-trained Social Workers. MRO’s emergency short-term foster care model was started in 2012, when families who could open their hearts and homes to welcome children and youth in crisis were recruited from local communities, churches and child protection networks. The recruitment process continues to be a rigorous process, involving application, review, assessment by Social Workers, as well as official registration with local authorities. Emergency Foster Care provides loving family-based care to children in a crisis situation, to prevent them from being placed into an orphanage as the first and only option. MRO now has a number of families who can receive up to six children into their home for up to three months. These foster families are provided with training and counseling, and paid a small retainer in order to keep placements open for whenever they are needed. 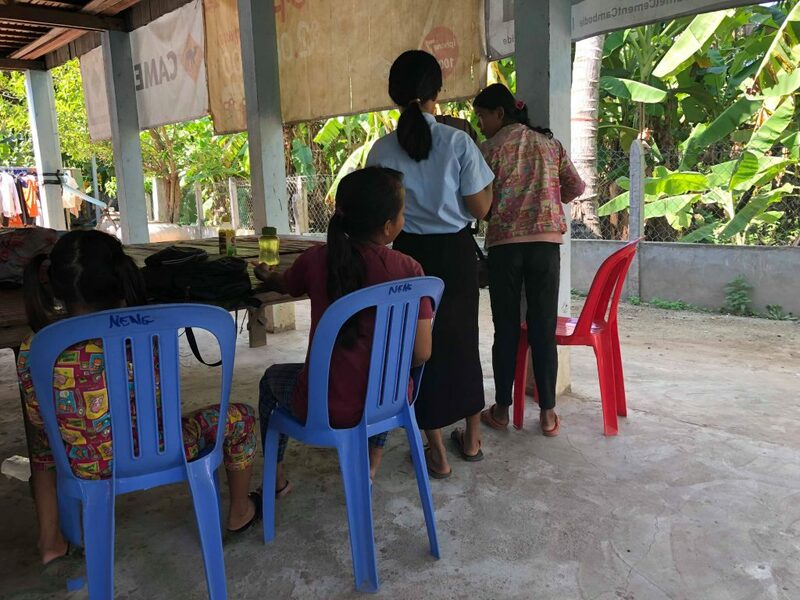 Children entering foster care are assigned a well-trained Social Worker, who uses case management procedures to reunite the child with their biological families or, when necessary, with a long-term Cambodian Foster Family. This model is administered in collaboration with four other partner organizations: Children in Families, Mother’s Heart, First Step and Prison Fellowship. The partners work together to provide this short-term family-based solution to children and young people in a wide range of difficult circumstances, including children and young people leaving orphanages, children with disabilities, abandoned children, boys and girls leaving abusive situations, girls and young women with crisis pregnancies and children of incarcerated parents. Adhering to local Cambodian culture, we pile into the MRO utility truck, “on time.” (In Western culture, we were running about 20 minutes late.) The truck, while worn in years, is roomy, handles bumps in dirt roads well, and, most importantly, has working A/C. After a quick stop for a team breakfast of Chinese noodle soup, we are on our way to visit our first of four families today. Veng Kimly, Jenna Forstrom, Pech Mono, Kosal, and Samnang. Joining me on this excursion is Pech Mono, a Social Worker who has been working for MRO for four years; Veng Kimly, a Social Worker, who has been working for MRO for two years and, I found out on this trip, recently returned back from work following maternity leave after the birth of her first child; Samnang, a Social Worker, who has also worked for MRO for two years. I learn that each Social Worker has about 20 cases and visits each case once a month or more if needed. Kosal, our Driver, has worked for MRO for eight years. Throughout the day, I’m amazing by Kosal’s ability to judge distance and space while driving through jammed, paved highways and between rows of houses on dirt roads. I’m also impressed with his ability to find a suitable place to string up a hammock between the truck and a tree to rest while the social work team conducts Foster Care visits. Our first stop is right off a paved street and down a short flight of earthen steps leading to an average sized home with a large garden surrounding it on three sides. 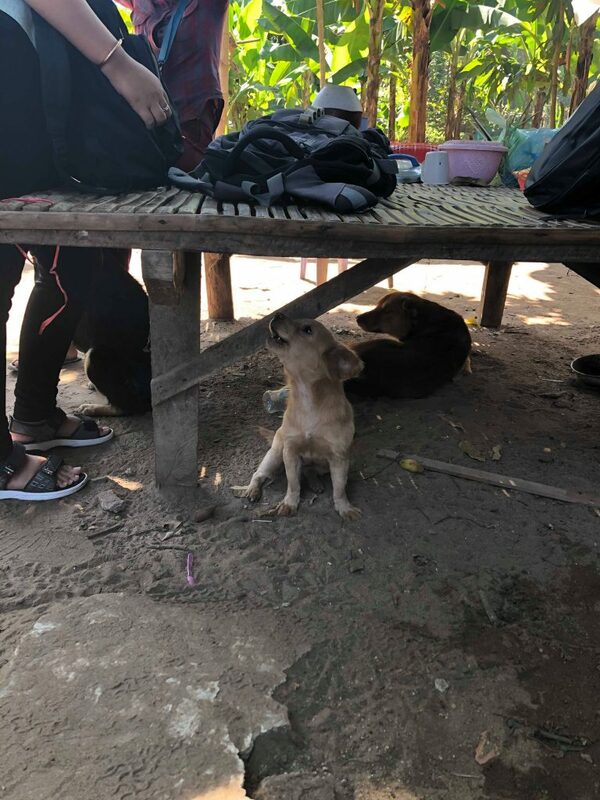 At the gate, a white Khmer mutt dog sits eager for us to enter the property. I’m immediately impressed by how clean and healthy the dog is. 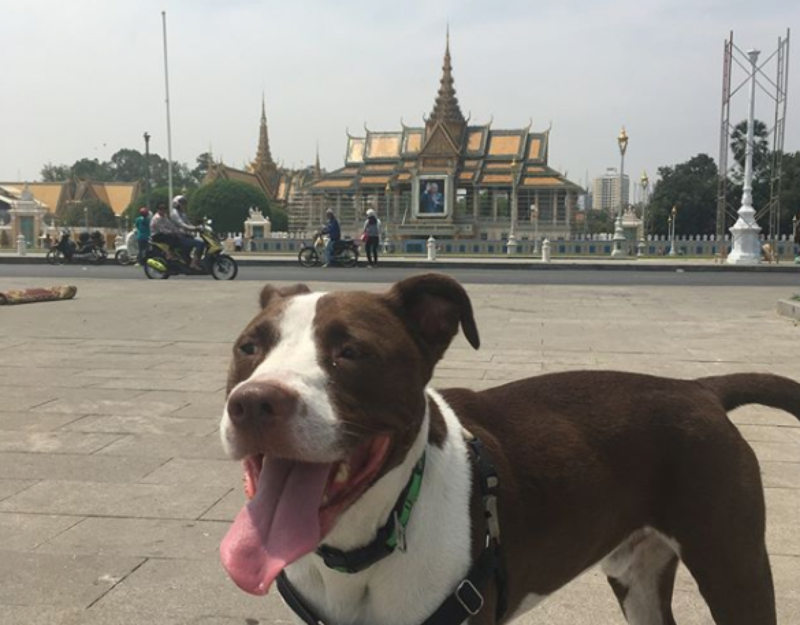 He spends some time sniffing me, no doubt learning that I too have a dog here in Cambodia. I’m told that this family has four foster children, two of whom have disabilities. In the process of traditional sampeah (Khmer greeting) with the foster parents, two children enter the yard, one child runs to grab some toys near the house. The other, who has a jaunting sort of walk, looks at me cross eyed, tracking my presence with some distrust. It’s clear by the jerky movements of this child, he’s one of the two children with a disability. [One of his eyes is nearly rolled entirely up into its socket.] Kimly encourages the boy to greet me. *Womp* two soft fists hit my stomach. I immediately stick my hands out to catch the hands before they hit me again. “Hey, ot-te / no,” I say in Khmer. Kimly hugs the children and apologizes. “No worries, sister, I’m a stranger,” I say “Choum reap sor oun / Hello, little brother,” I greet the boy. He continues to track me with his working eye. The dog, sensing the commotion runs over. The little boy sits down and grabs at the dog, pulling it on to his lap. I’m amazed at how kind the dog is given that this child’s fine motor skills are lacking and he seems a little rough on the dog. Yet the dog clearly loves the boy, rolling over on his back accepting a belly rub from the child. Samnang catches up to Kimly and I and tells me we will continue on to the second family, while Mono stays and continues to visit with this family. 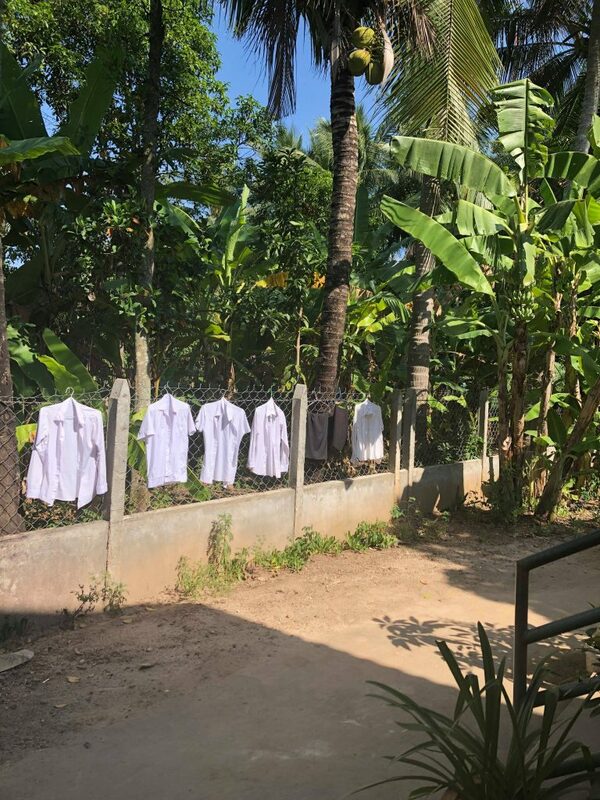 School uniforms drying in the sunlight. We walk through the garden and onto a partially paved and partially dirt road. There is a natural layer of protection from the sun, the road is lined with mature banana trees whose leaves provide shade across the path that we are a walking on. I’m amazed by how quiet this sleepy little village seems compared to the noise, construction and dust of Phnom Penh. I can hear birds for the first time in days and don’t see any bags of trash anywhere. We pass a local hospital and school combination building. Children playing in the court yard and nurses with starched, white, 70s era caps milling about under the blue cross sign on the building. A tool Social Workers use to speak with Foster Care children. 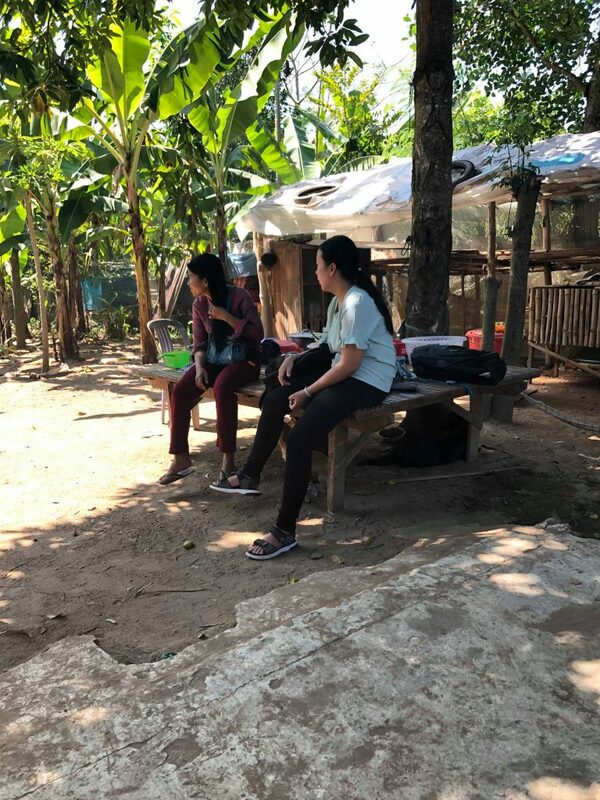 The second family home is two traditional Khmer homes, wooden houses on concrete pillars that provide shade underneath during the hot, dry season and that is above the flood waters during rainy season. Sitting under the house are two young women, doing homework as their Foster Mom comes out to greet us. I’m told there are four children living here in Foster Care, the two girls and two more who are already at school. One of the girls we meet with has a sister who is already re-integrated with their birth family. I will apparently meet her next week on another outing. The two girls each receive a brand new pencil, pen, eraser, and ruler from the Social Workers. I make a mental note to ask about pencil cases and bike helmets (few wear them in the provinces) for the next visit. Kimly sits with one girl to talk, while Samnang and I go with another girl to sit and talk. Samnang inspects her school journals. I’m learning Khmer in Phnom Penh so I’m super impressed by the young woman’s hand writing even though I can only make out a few words. I burst out laughing when I see this “S” design in one of her note books. Samnany and the girl both look at me. “My friends and I used to draw the same thing in our notebooks when I was your age in America,” I explain. Samnang spends some time encouraging the girl and tells me that she is getting top marks for math. 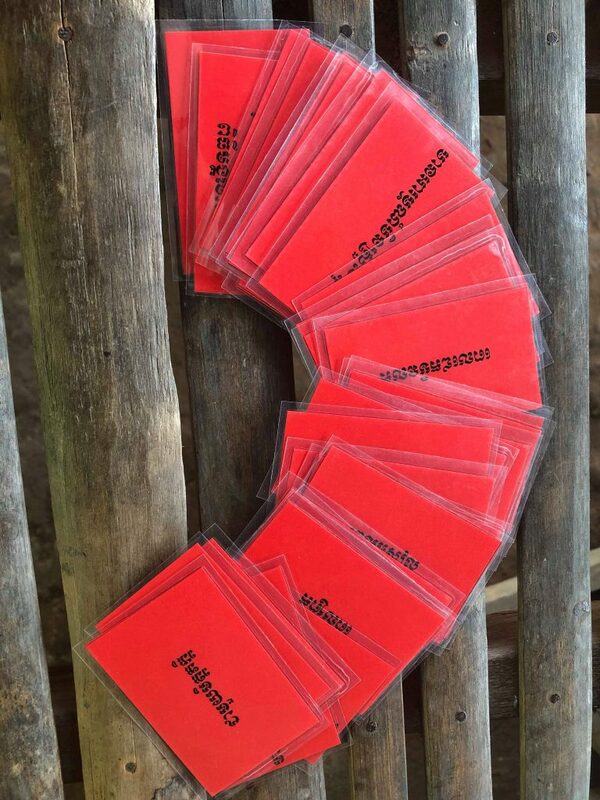 He then pulls out a pack of laminated red cards with Khmer writing on them. He explains that this is a tool to help Foster Children. They can look through the cards and pick a few to talk about with the Case Worker. They are like prompts to start discussions about how the child is feeling. The two of them continue to talk in Khmer and I drift back and forth between trying to figure out what they are saying and wanting to respect this private conversation between a Social Worker and a Foster Child. I settle on just sitting in this quiet space and praying over the home, the Foster Parents and the Children under their care and the Foster Children’s birth families. The meeting takes about a hour and half. Kosal and the truck are waiting for us as we walk out of the home. Some Foster Care girls and their friends studying. We stop for a quick lunch. I spend some time chatting to Kimly about her baby and maternity leave. I also try “prahok” for the first time. This is a smelly, salted, fermented fish paste that is used as a condiment here in Cambodia. Most families have their own recipe. As I take a bite, the team looks at me with anticipation. I made an exaggerated goofy face and they start laughing. Samnang asks what I think of the fish. I decide to answer truthfully, “I don’t think I would order it on my own, but if it was presented to me, I would try a bite.” He jokes that I’ll get use to it. We head out again, arriving in a small village on a dirt road. We come to a very small home, right on the Tonle Sap River. By US standards, it’s a million dollar view. The cool breeze blows off the river and there are half a dozen chickens running around with about a dozen chicks each following their mothers about the yard. On a large outdoor bed lies a very old woman sleeping. I’m told she is over 90 years old and I’m impressed that she sleeps without even a pillow. The Foster Mom is in her twenties and lives in this home with her mom and the grandma who’s resting. There are five Foster Children who live here but they are all out playing in a field nearby. Kimly and the Foster Mom sit and chat for about 30 minutes. Then we load back into the truck for our final stop of the day. Another Foster Care visit stop. After a short drive, we arrive at the fourth and final Foster Care Family of the day. 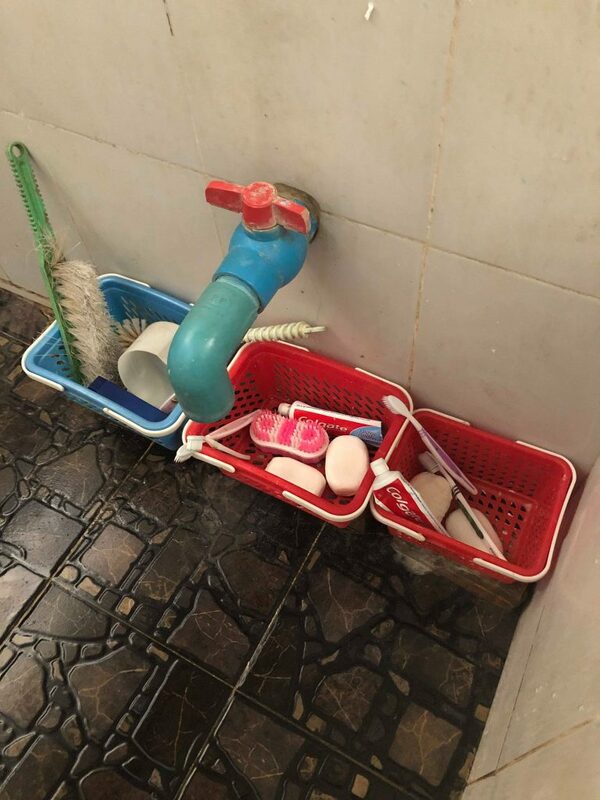 I’m told four children live here. Two are at school and two are home for the visit with their Social Worker. Samnang and I sit down with the two young boys, who are eager to show us their school books. 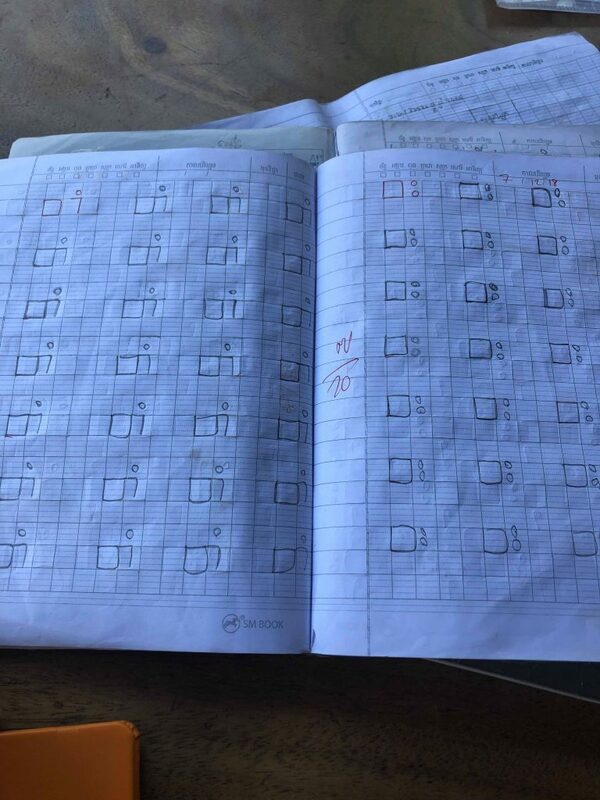 They are younger than the girl from the second family and are just learning the Khmer alphabet so it’s a little easier for me to follow along with their writing. We sing the Khmer alphabet together while Samnang checks the rest of their school work. These boys wiggle around trying to one up each other on their knowledge of the vowels in Khmer. (There are over 20 vowels in Khmer.) Samnang asks one of the boys about a barely visible bruise across the boy’s nose. Samnang tells me it’s from an accident where the boy fell off his bicycle. “Yet another reason to ask about the helmets,” I think to myself. I’m also very aware of the fact that the other boy’s face is covered with little scars. They are all completely healed, but I wonder how he got so many in such a short life time. This young boy has an infected tooth. Samnang tells me he’s arranged to have someone from the MRO team come get the boy in a week to take him to Phnom Penh to go to a dentist. One of the boys asks to call his mother and uncle, but unfortunately, we don’t have their phone numbers with us. Finally, Samnang speaks to the boys about hygiene, reminding them they need to take very good care of their skin and their clothes. This is their responsibility. They aren’t filthy, but they definitely looked like two young children who had spent the day playing outside in the fields. He talks to them about how they should scrub their clothes between their hands and make sure to wash their bodies so they don’t get dirt marks. After this little pep talk, Samnang presents the two boys with the same school supplies as the girls from the other visit. We load up to into the car and head back to Phnom Penh. I thank God for how He has made His presence known to me for yet another day and keeping me safe for another day as well. Would you please join me in continuing to pray for the Foster Parents, Foster Children and their biological families? May we all have eyes to see, ears to hear and minds to understand where each one of us is coming from. Oh, I loved reading this! I felt like I was right there with you. What a wonderful program, so exciting to be able to see it in action.